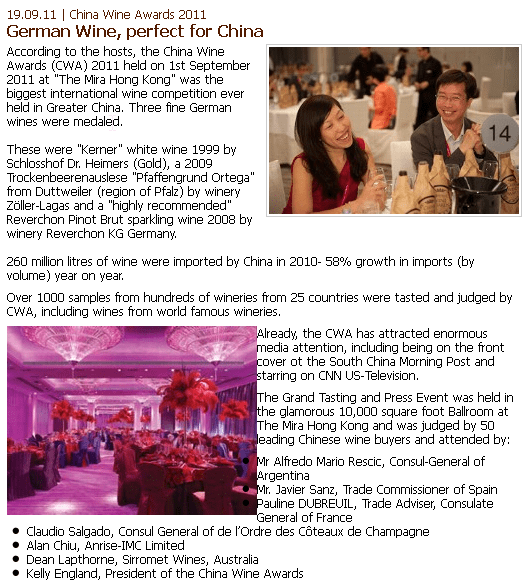 According to the hosts, the China Wine Awards (CWA) 2011 held on 1st September 2011 at “The Mira Hong Kong” was the biggest international wine competition ever held in Greater China. 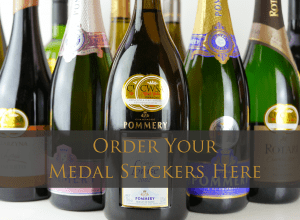 Three fine German wines were medaled. These were “Kerner” white wine 1999 by Schlosshof Dr. Heimers (Gold), a 2009 Trockenbeerenauslese “Pfaffengrund Ortega” from Duttweiler (region of Pfalz) by winery Zöller-Lagas and a “highly recommended” Reverchon Pinot Brut sparkling wine 2008 by winery Reverchon KG Germany. 260 million litres of wine were imported by China in 2010- 58% growth in imports (by volume) year on year. Over 1000 samples from hundreds of wineries from 25 countries were tasted and judged by CWA, including wines from world famous wineries. Already, the CWA has attracted enormous media attention, including being on the front cover ot the South China Morning Post and starring on CNN US-Television. 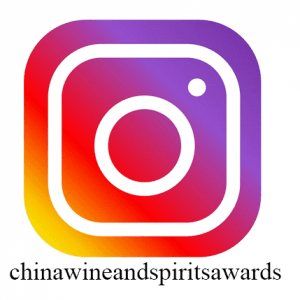 The CWA is the only major international wine competition judged specifically for the China market and is entirely focused on Chinese consumer preferences. The CWA 2011 judges included respected Chinese wine importers, distributors, restaurant group owners and retailers who together purchase in excess of 5 million bottles of wine this year alone. 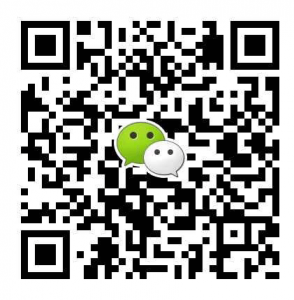 What Chinese consumers and major wine buyers actually want in their market is the primary focus of the CWA. By celebrating what is a perfect fit for China, the winners of the CWA enjoy the official and revered stamp of approval which in turn enormously helps to boost sales.